The Alfa Romeo Giulia badge returns after nearly four decades of hibernation – slapped on the tail of the first rear-drive Alfa in 25 years. Sharing its ‘Giorgio’ platform with the new Stelvio SUV, Giulia is a sporty yet luxurious sedan aimed at C-Class Mercedes, 3-Series BMW and Audi A4 buyers. The local Giulia line-up comprises one body style, one transmission, a choice of three engines and prices varying by $83,000 across five models. So let’s get more closely acquainted with them and see which one has the specification you want. When it comes to options, Alfa Romeo has plenty to offer, starting with a choice of black, red, beige or tan leather trim. Fourteen colours make up the palette, consisting of three standard solid colours, a further eight metallics ($1300) and three tri-coat hues, which add $3500. A sunroof will cost you a further $2200 and there are also several options and option packs: Veloce at $4000, Adaptive Bi-Xenon headlights for $1300, a 14-Speaker Harman Kardon audio system for $1500, and an anti-theft alarm system for $750. Painted brake callipers in yellow or black will set you back $910 and exclusive to the Quadrifoglio are carbon ceramic brakes for $13,000, a leather/Alcantara/carbon steering wheel for $650 and a pair of Sparco carbon sports seats at $7150. As standard, the Giulia range includes Forward Collision Warning with Autonomous Emergency Brake, Pedestrian Recognition, Integrated Brake System, Lane Departure Warning, eight airbags, a reversing camera with gridlines, front and rear parking sensors, auto headlights and wipers. 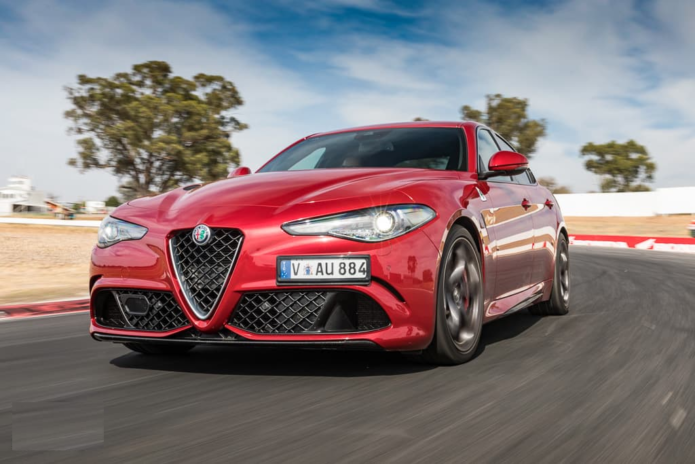 Moving up to the Super provides the convenience of active cruise control plus blind spot monitoring, but if you want rear cross-path traffic detection, prepare to pay plenty, as it’s only on the top model Giulia Quadrifoglio. Starting with the infotainment systems, all Giulias come with an 8.8-inch screen incorporating satnav and digital radio plus the usual Bluetooth audio and phone connectivity. While the Giulia and Super models have an eight-speaker audio system, the Veloce gets two more speakers to enhance its 400-Watt output with subwoofer system. It’s only in the Quadrifoglio you can experience the 14-speaker Harman Kardon Surround Sound Theatre system. Want heated front seats and steering wheel? Step over the Giulia and into the Super; it’s the cheapest way of getting them. If power bolstered sports leather seats are a must, you can get them two ways. Order the entry-level Giulia with the Veloce option pack and pocket substantial savings over the Veloce itself. Or order the Veloce and get the seats, plus aluminium trimmings a six-way power driver seat with memory settings and alloy sports pedals. But if you want standard soft-leather seats, tick the box marked Super and relax in its pair of eight-way Pieno Fiore powered front seats with four-way lumbar adjustment. The Super raises the interior ambience with its leather trimmed doors, dash and centre console. Identical to the Giulias of the 60s and 70s, wood trim inserts are standard in the Super. Want the lot inside? Then bankroll yourself into the Giulia Quadrifoglio with its four sports seats swathed in a combination of leather and Alcantara. There is leather on doors and across the dash, along with a black headlining, auto dimming mirror, exclusive steering wheel and real carbon accents throughout the cabin. Enjoy driving? Active Suspension is a must to tease the most out of the Giulia chassis and the cheapest way to get it is order a Giulia with the Veloce option pack. You’ll have a ball and save a few dollars, but you do miss out on the limited-slip differential and uprated braking package of the Veloce itself, so that’s something to consider. If you want your Giulia to stand out, it’s a no-brainer. Go and buy the Giulia Quadrifoglio with its 19-inch alloy wheels, sports body kit, adaptive headlights, red brake callipers, Privacy glass, rear diffuser and gloss black window surrounds and bi-xenon headlights. But if you don’t have a lazy $143,900 to spend, the Veloce is around half that and also boasts red callipers, 19-inch wheels and privacy glass, but no diffuser and has chrome around the windows. The Giulia and Super variants ride on 18-inch alloy wheels. Three petrol engines and one diesel complete the line-up and all share the same ZF eight-speed automatic transmission. Powering the entry-level Giulia and Super variants is a 2.0-litre turbocharged four-cylinder engine producing 147kW and 330Nm. The Super is also available with a 2.2-litre diesel developing 132kW and 450Nm. A beefier version of the 2.0-litre turbocharged four sits in the Veloce, with 206kW and 400Nm. Then there’s the ballistic Giulia Quadrifoglio with its twin-turbocharged V6 belting out a whopping 375kW and 600Nm. As a value proposition the entry Giulia is well equipped and competitively priced and for many an ideal choice. But stretch the budget a little to enjoy the extra grunt, tuneable suspension, limited slip diff and upgraded brakes of the Veloce variant that combined, take the sublime chassis to a higher plane. If money is no concern, plump for a red Giulia Quadrifoglio. It’s a bit more expensive than the BMW M3, but a lot less than the Mercedes-AMG C63. It runs a sub 4.0-sec 0-100km/h time and is stratospherically quick, superbly composed and rewarding to punt, as the esteemed judges have concluded.